By Calestian, April 11, 2015 in Completed Scripts/Plugins/etc. Setup Instructions in the Script. Very nice work...but there is an error.. When an achievement is unlocked, after the notifications, if i open the main menu and then close it an error report comes saying "Script 'Window_Base' line 84: RGSSError occured. disposed window. I tried to unlock the very 1st achievement in Category - General - Be Awesome. All goes well, it unlocks, notification comes saying "achievement completed", "achievement unlocked" and then when ever i try to open menu and close it the error report comes..
Can you please post a demo >_< ? Awsome script btw. is there any chance to setup the â€‹prerequisites for achievement. Like need tier 3 from Treasure Hunt achievement to unlock it. At the moment Prerequisites take only another achievement index as a valid value. Eg. Achievement #2 has prerequisite Achievement #1. If you want something like tiers as prerequisites I can make a modification, but that will be during the weekend. Well, that doesn't bother me. I like the script too much. I always wanted a Categorized Trophy Scene script, until now there was only one script, Yeah that;s right, the Achievement Script by CSCA.. But now u just made my dream come true.. This one has more customization options. Very good work.. Keep the hits coming..
As per my opinion, this script needs only one more thing and that is a sound effect, u know what i mean, play a notification sound when an achievement is gotten or unlocked.. Thank you for a quick updated reply... You really rock.. Updated Main Post with Conditional Branches. Add an additional feature that changes the achievement icon when the achievement is completed..means an achievement icon changes after completing it. 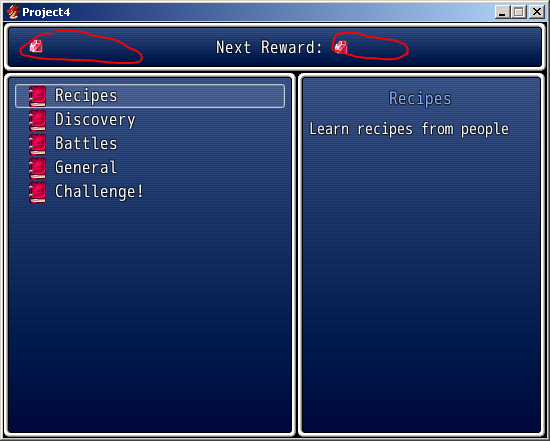 (Note: I do not mean category icon, but the Icons of achievements inside the categories). You used the color changing system which turn the achievement name color into yellow from white when it is completed.. How about icon preference? Edit: Also it will be greater if you implement an icon preference with Locked achievements. which means locked achievements will have different icon, when it is unlocked the icon changes, and when it is completed the icon changes as well. There is Achievement_Unlocked_Icon, Achievement_Completed_Icon and Achievement_Locked_Icon. Umm you know. You probably need to ensure that the script is bug free cuz when I view the achievement screen it doesn't display total AP (Achievement Points) and just showing the icons. It does display everything on my game. Could you please provide me with a screenshot or something? I do some light testing before i post an update, but I can't check for every possible bug every single time. Sometimes bugs just don't get noticed, that's why I'm posting the script here, so you guys can give me a heads up of any possible bugs to fix. Could you please post the script as you have edited it in a pastebin? I can't presume to get my client to produce the exact same thing. AP works just fine for me. Edit: I will look into it someday tomorrow, in the meanwhile, post the script please.